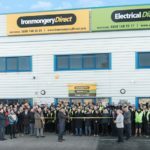 IronmongeryDirect, and sister company ElectricalDirect, part of the Manutan European Group, has completed a major expansion project, to house 1000’s more new products. The new warehouse officially opened on Thursday 17th January by Xavier Guichard, Chief Executive Officer at Manutan Group and Wayne Lysaght-Mason. They were also joined by the rest of the Manutan Group Management Board, along with over 200 staff to celebrate the landmark. In 2019 IronmongeryDirect is celebrating its 50th year supplying architectural ironmongery to tradespeople. Starting out as a traditional ironmongers, today customers can browse over 17,500 products in the catalogue and online.